We will no longer be accepting radios for repair/restoration. Radios listed for sale will be from our collection/museum. It seems everyone has his own personal definitions of what a restoration is. In years past you could always find a heated discussion over the term "antique". Fortunately antique has fallen out of vogue and been mostly replaced by the term "vintage". It seem that everything is of some vintage, so there is not as much interest in defining the term. Well, the meaning of "restoration" has not been so lucky. For practical purposes the service on a vintage radio should be considered as two parts, the chassis (electronics) and the cabinet. The skill and tools required to service each of these two parts is so different that some technicians will only service the chassis and some cabinetmakers will only repair the cabinet. One is a technical challenge the other is an art. Each of them can be restored or more simply, repaired. Simply said, many radio cabinets produced in the 1920's and 1930's were beautiful. As time passed, more and more man-made materials were used. Some of these later radios, such as the Catalins are very prized by collectors. But, eventually the magic was lost in fake chrome and wood-grained particle board. In a world were everyone gets a new cell phone every 2 years it is a wonder that any 80 year old device has survived at all. We are fortunate that many of these radios were so (relatively) expensive that people just could not throw them away, even when they got a new one. The Great Depression just added to this. Even some of the cheap radios of that time were hard to pay for. After 70 or 80 years many of these cabinets are in "less than perfect" condition. Repair defects in the cabinet - veneers, glue joints, dings, insect damage and so on. Seal and fill the grain. So many of the nice veneers like walnut and mahogany have open grain and look BAD if not filled. Take a look at a piece of oak furniture. It is common practice not to fill the grain in oak. See how rough it appears. You don't want this look in the cabinet of your old radio. Sanding and toning. Some manufactures used stains and dyes to add color to "white wood" and blend the tone of the entire cabinet. But most often this was done with toners, basically another part of the spray-on lacquer finish. This is where the painters "art" comes into play. Some manufactures used toner freely "blending" one panel into the next. Others used toner but masked off adjacent panels. And yet others used toners to provide highlights. A finisher must study the original closely to guide him in the reapplication of these colors. Often these fine touches must be applied by airbrush and colors custom mixed (we do that). If this is not done there is stark contrast between the structural lighter woods and the darker veneers. You have all seen a cabinet that has been "refinished" and it is either all one color or the lighter woods are way to light. It might look better but it is not restored. Following toning, multiple coats of gloss lacquer are applied between resanding with very fine sandpaper. Then the top coat is sanded and buffed out. If the lacquer is not buffed it can have an annoying shiny appearance. Smooth and glossy is the object here. This process can take several weeks or longer as glue and coats of toner and lacquer must dry before sanding and buffing. The cost of restoring a cabinet may match or exceed the cost of restoring the chassis. There is simply more time and work involved. Accordingly, smaller table top radios are usually cheaper to restore than floor standing consoles. And the original condition of a cabinet can make a good deal of difference in the costs. Below is a Picture of the under-side of a restored Atwater Kent Chassis. The objective of restoration is to have the chassis appear and work as if it had just come from the factory. All of the wiring is new. The capacitors and resistors have been rebuilt. The power cord was replaced after this picture was taken. Below is a picture of another Atwater Kent chassis that has been - well - "worked on". The new parts are all visible. The wire was not all replaced and that which was replaced is not of the proper type or color. There are connections wrapped with tape and "flying connections" - loose parts. Even after this "repair" the unit was miss-wired and could never have worked. Many failed components were left in place. Keep in mind that at one point this radio was resold in this condition. Would you plug it in? Restoration of a chassis in this condition is always more dificult than one that has not been "repaired". Below is another example of a chassis we restored. This one is from a 1931 Philco 20. Every capacitor and resistor has been replaced with new parts. The most experienced collector might be able to detect the new parts, can you? 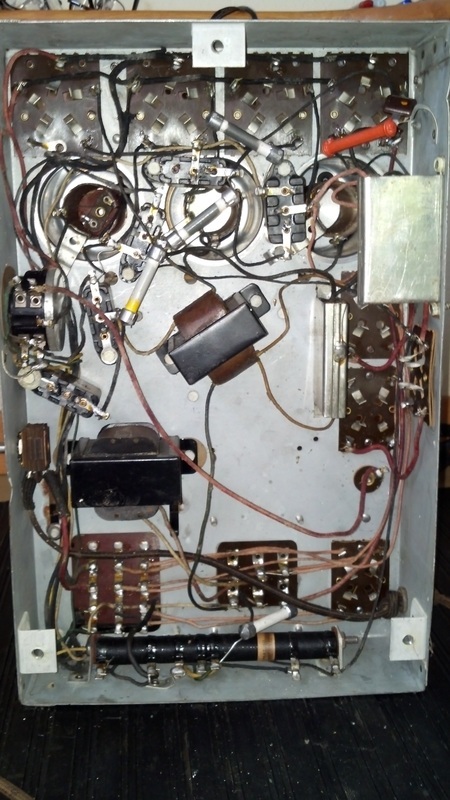 Here is a "before and after" of a 1941 GE. Beyond needing all of the normal parts restored, it also had a great deal of crumbling rubber-insulated wire. The quality of the chassis restoration should match the restoration of the cabinet. Some people will say "Why is it important to maintain such originality in a part of the radio that is not normally visible?" The answer depends on what you want. Just as collectors of vintage cars insist on original, or, at least reproduction parts. Radio collectors are no different. The older and/or more rare a radio is, the more important it is to maintain it in original condition. The simplest way to accomplish this is to do nothing. That is, buy an untouched radio in as perfect condition as possible. Then NEVER plug it in. Well then, the problem is solved. That is, unless like most people, you want the radio to work. Most 80 year old radios that have never been serviced (even serviced well, unlike the middle picture above) will NOT work. Those that do will often hum loudly. Even the small number that do work have a VERY high likelihood of catastrophic failure. Then repair is expensive and some parts may be nearly impossible to find. If you only want to display your vintage radio, dust it off and place it on the mantel. Some people cut the cord off, if it has not fallen off already, so that the radio can not be plugged in by accident. If you want the radio to work, find a qualified technician to service it for you. We strongly encourage families to keep the old radios that have been passed down from older generations. One day a family member will appreciate having them. P.S. I usually assume that most people looking at this site are radio collectors so you will have to forgive me for abbreviations and a somewhat technical approach. It has just been too many years doing radio repair as a trade, a hobby and then a business. Sometimes I forget that "regular" people visit this site as well. If you have questions about a radio, contact us. I try to respond to all inquiries quickly. I am not. however claiming to know everything but my advise is free and if I don't get back to you , try again. With this in mind I thought it would be nice to ad a FAQ from our emails including some myths and common sales claims. This is a work in progress and probably always will be. My radio does not work. It (just) needs a tube. Well it might need a tube. Very few of the radios we see have a dead tube or one so bad that it would keep the radio from working at all. It is not uncommon to find weak tubes that should be replaced to save on another service call later. But in general tubes are very reliable if used as intended. Other failed parts in a radio can lead to premature tube failure. And this leads us to the real answer. 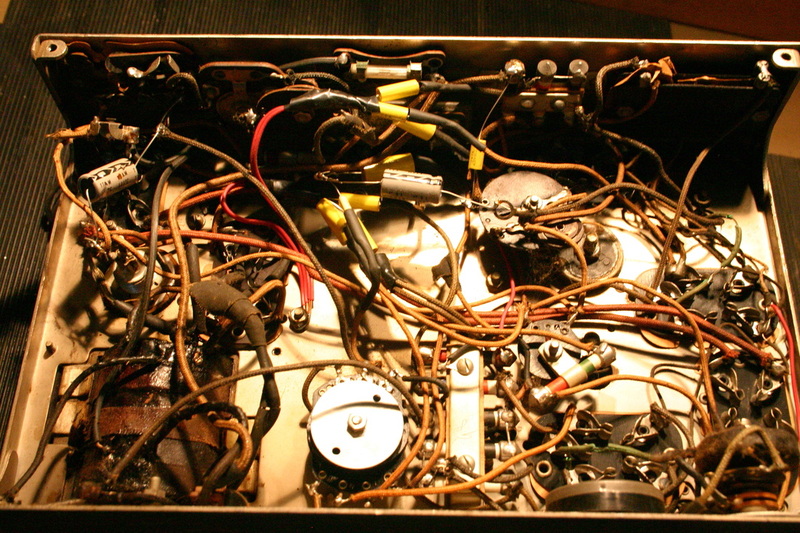 There are many parts in a old radio that are MUCH more likely to fail than a tube. A lot of those parts and wiring failures are detailed above. Some of these failures are SO common that an ORIGINAL radio is very unlikely to work and attempts to turn it on will often lead to needing tubes and much more. So when the CL ad says it probably just needs a tube . . . . . They don't make tubes anymore. "They" do make tubes. They, most often, being the Russians and Chinese. There is still a demand for some tubes, mostly those used for high end stereo equipment and musical instrument amplification. This does help with some of the tubes used in old radios. I would say that a good percentage of the tubes used in post 1935 radios are either still being produced or are readily available at a reasonable price. However a lot of collectors and musicians prefer the old American and European tubes pushing the prices of these to a high premium. Very few types of tubes are difficult to find, there are a few, but some are expensive. What is "Pot Metal" and why do I care. Pot metal is concoction of various metals that have a relatively low melting point. It was/is easy to make metal castings in a rather poorly equipped machine shop with little cost. And so, that is what they did, but it was not limited to the small manufactures, the big ones did it too. It was not limited to radio parts, but commonly used everywhere. So, what is the problem? In some cases nothing. In many cases a critical radio component is virtually unavailable because ALL of the pot metal castings have decomposed. Now, you can look up the formula, and the reasons for the failure elsewhere, but the just of it is that some of the alloys created were slightly less stable than others and environment may have been a factor. The result is first a swelling which leads to cracking and an internal pressure that can sometimes pop a chunk off of the larger assemblies. There are particular parts and particular manufactures to be on the watch for pot metal issues. One of the worst/most common I encounter is the tuning caps in Majestic brand radios of the 70 and 90 series. These are almost always damaged beyond repair and when you find a replacement part, it is no good either. The prevalence for these issues seems to diminish somewhat after around 1935. It could simply be age or a better formulation of the metal. Things to know: NEVER try to bend, hammer or twist a pot metal part. Bad things will happen. In theory heating it can melt the metal, but the result is always a mess. Recasting the part, if you can find a good original - not swelled or cracked is possible, but not advised for the average repair person, I have recast some of these pieces in plastic.